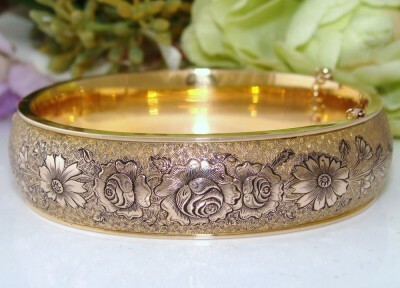 This Gorgeous Antique bangle’s pictures do it no justice. It is an outstanding example of its maker’s Quality and Design and is a Victorian Revival piece of the 1880s, which was popular in the 1920-30s, and this is due to the enamelled decoration. It features etched Cabbage Roses – the Ambassadors of Love - and foliate accents upon its richly domed face sweeping their way to the hinge & clasp areas. Black enamelling accents this design beautifully. All of this rests upon a richly stippled background with the sharp, square edges forming a border at the bangle’s edge. What a work of art and the exact design is duplicated on the back. The hinge and clasp are in perfect working order and the original safety chain is in place. It has a wonderful buttery yellow gold hue and the silky feel associated with solid gold. Maker: Plainville Stock Company, established in 1884 and still believed to be operating today. They were known to produce sterling & gold, gold filled and 10 carat gold jewellery. This bangle is in near MINT Antique condition. I believe it was rarely is ever worn. There is NO wear and no dings, dents or damage, no loss of enamel from the decoration. Bangles in this fabulous condition are difficult to come by. This is of Heirloom Quality and would make a fantastic addition to any jewellery collection. This will no doubt increase in value unlike a new purchase today.